Pesticide regulations designed to protect honeybees fail to account for potential health threats posed by agrochemicals to the full diversity of bee species that are even more important pollinators of food crops and other plants, say three new international papers co-authored by University of Guelph biologists. As the global human population grows, and as pollinators continue to suffer declines caused by everything from habitat loss to pathogens, regulators need to widen pesticide risk assessments to protect not just honeybees but other species from bumblebees to solitary bees, said environmental sciences professor Nigel Raine, holder of the Rebanks Family Chair in Pollinator Conservation. “There is evidence that our dependency on insect-pollinated crops is increasing and will continue to do so as the global population rises,” said Raine, co-author of all three papers recently published in the journal Environmental Entomology. Government regulators worldwide currently use honeybees as the sole model species for assessing potential risks of pesticide exposure to insect pollinators. 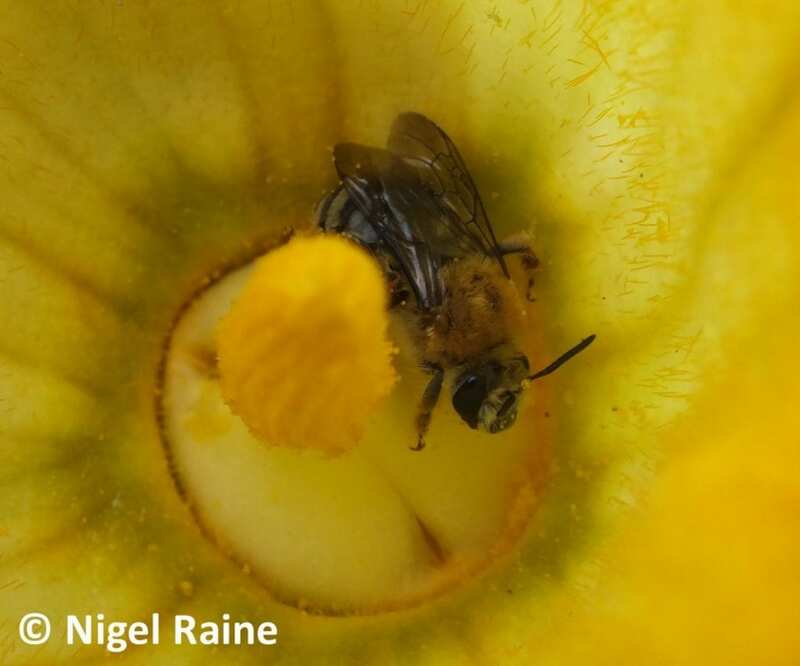 But Raine said wild bees are probably more important for pollination of food crops than managed honeybees. Many of those wild species live in soil, but scientists lack information about exposure of adult or larval bees to pesticides through food or soil residues. The papers call on regulators to look for additional models among solitary bees and bumblebees to better gauge health risks and improve protection for these species. She said bumblebee queens have different life cycles than honeybee counterparts that may increase their contact with pesticides or residues while collecting food and establishing colonies. Like honeybees, bumblebees forage on a wide variety of flowering plants. But because bumblebees are larger, they can carry more pollen from plant to plant. They also forage under lower light conditions and in cloudier, cooler weather that deter honeybees. Those characteristics make bumblebees especially vital for southern Ontario’s greenhouse growers. “Greenhouse tomato producers rely on commercial bumblebee colonies as the only source of pollination for their crops,” said Gradish. The new studies stem from workshops held in early 2017 involving 40 bee researchers from universities and representatives of agrochemical industries and regulatory agencies in Canada, the United States and Europe, including Canada’s Pest Management Regulatory Agency. “I hope we can address shortfalls in the pesticide regulatory process,” said Raine, who attended the international meeting held in Washington, D.C.